History has been made. On Friday, the European Union voted to ban the world’s most widely used class of pesticides from being sprayed on fields. By the end of 2018, neonicotinoids will only be tolerated in closed greenhouses. In February, the European Union’s scientific risk assessors (Efsa) published a report concluding that the pesticides contaminate soil and water and, as a result, make their way to wildflowers and succeeding crops. Because of this, they pose a “high risk” to both honeybees and wild bees. The Guardian reports that the ban on the three main neonicotinoids (also referred to as “neonics’) has widespread public support. Nearly 5 million people signed petition from campaign group Avaaz to prohibit the toxic pesticides from being sprayed. Pesticide manufacturers and a handful of farming groups claim the EU is being “overly cautious.” As a result of the ban, they say, crop yields could fall. Guy Smith, NFU deputy president, said: “The pest problems that neonicotinoids helped farmers tackle have not gone away. There is a real risk that these restrictions will do nothing measurable to improve bee health, while compromising the effectiveness of crop protection. 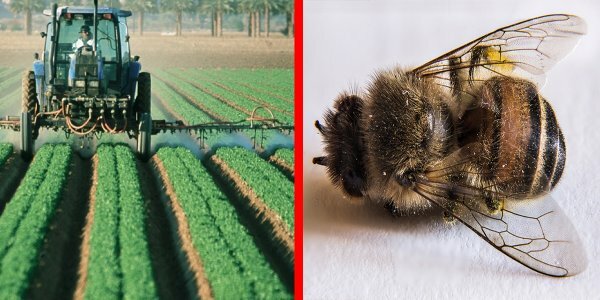 Despite vehement opposition, members still voted to approve the ban.This is because neonics are well-established to to cause a wide range of harm to individual bees. Without bees, hope of nourishing the world’s growing population is lost.
? The Four Pillars Of Disaster Shamanism These Snazzy, Pink Shoes Are Made From Recycled Chewing Gum ?